Super 8 was once the filmmaking format for millions, home-moviemakers and experimental artists alike. But it hasn’t disappeared; it’s a small yet quietly flourishing niche market, and Daylesford, in regional Victoria, is home to the only dedicated Super 8 lab in the southern hemisphere. Super 8 is a narrow-gauge film format created 50 years ago. It was popular because it was easy to use, cheap, quick, and aesthetically appealing; the sound quality was good, and when projected it looked much better than the video of the time. But the advent of digital technology changed everything, for the product, for companies that made and processed film, and for people who still wanted to use it. Young filmmakers come across the format and like what they see. And feature film and TV directors often want footage with an archival look. Working with Super 8 used in re-enactments, dream and memory sequences, Tuohy says, “is a small but consistent part of what we do”. Whoever their customers are, very few of them want to run their film through a projector. They ask for processed film and a digital transfer: this allows them to edit, share, upload. There have been attempts to simulate Super 8 – you can buy an app for it, for example – but if the look appeals, and you also want to make something that’s emotionally engaging, Barrie says, you’re better off with the real thing. For would-be Super 8 users, second-hand camera are easy to find online and relatively cheap. Film stock is harder to source locally; nanolab sells eight different kinds. 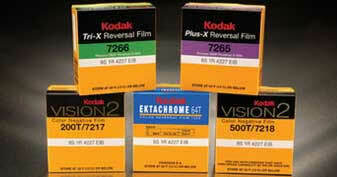 Some formats have come and gone, but while the demand is there, Kodak is committed to making film available. In the meantime there are smaller companies and labs around the world setting themselves up to be more self-reliant, if Kodak abandons film. Super 8, Tuohy believes, has a future. One of the things that’s still special about the format, he believes, is that it carries the association or memory of experiencing moving images for the first time: of seeing an early image of yourself, or your parents.